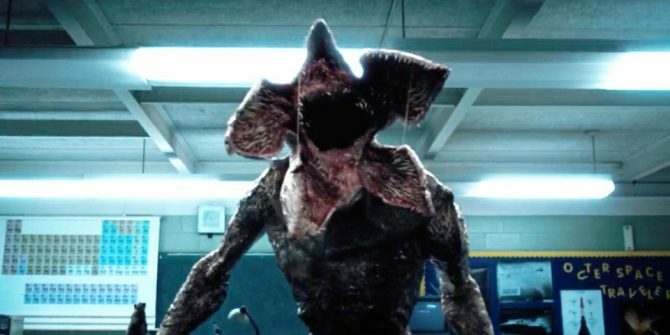 Stranger Things Season 2 Monsters Will Make Demogorgon "Look Quaint"
Among many other things, part of what made Netflix’s Stranger Things a super smash-hit when it arrived last summer on the streaming service was how much it leaned into its numerous horror movie influences. At the crux of this, of course, was the terrifying creature nicknamed the “Demogorgon” by Mike, Eleven and their friends, which hails from the mysterious realm called the Upside Down. An unstoppable monster with a face like a Venus flytrap, it won’t be easy to top in the second season. Still, the showrunners think they might have actually managed it. Stranger Things producer Shawn Levy spoke to YouTuber GoldDerby about the new season recently and promised that things will get much darker and more dangerous when the hit series returns. We haven’t seen much of season 2 at the moment, but we think we might just know what this evil force is that will make the Demogorgon look like a puppy dog. In the extremely brief Super Bowl teaser released in February, a gigantic tentacled creature can be seen floating in the (oddly red) sky above Hawkins. What exactly this monstrosity is we don’t know, but it certainly looks pretty threatening. Levy also spoke some more about having two acclaimed movie directors on board to helm episodes of season 2. Namely, Electrick Children’s Rebecca Thomas and Pixar stalwart Andrew Stanton (A Bug’s Life, Finding Nemo, WALL-E). He admitted that last year he and the show’s creators, the Duffer brothers, were “very, very protective” of the series but now feel established enough to open their doors to new creative voices. He also said that Stanton and Thomas’ episodes are “turning out great.” Colour us excited.